Patina celebrates the art of a wedding by combining award-winning cuisine and legendary personalized service to create awe-inspiring and momentous occasions. Our exceptional artistry and creative design coupled with our innovative catering and imaginative venues in Los Angeles and Orange County, has made us the premier caterer on the West Coast. We are committed to providing you with the very best quality cuisine, exceptional service and genuine hospitality on your special day. A Patina wedding represents the ultimate expression of style and elegance. Let us help you plan, design and coordinate your 2019 wedding. 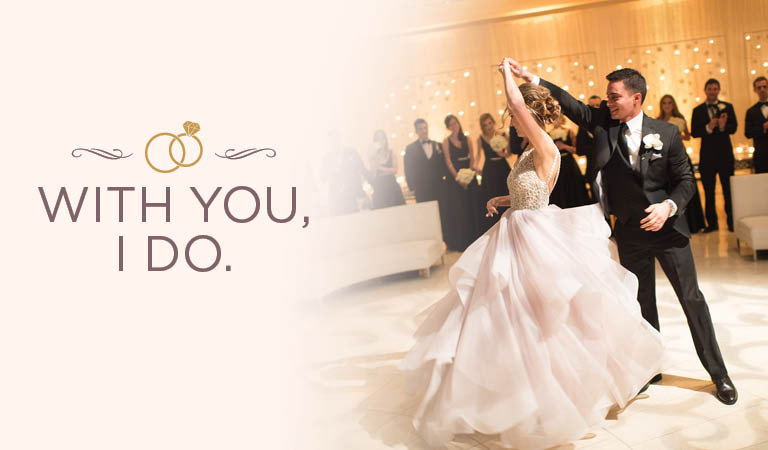 Book your wedding by March 31, 2019 and receive exclusive savings and perks! Lush greenery, tranquil fountains and a remarkable view of the downtown skyline make Café Pinot one of LA’s most romantic cosmopolitan wedding destinations. Situated on the grounds of Maguire Gardens at the Los Angeles Public Library, the restaurant offers the feeling of a heavenly oasis in the center of bustling downtown providing an idyllic backdrop for a romantic wedding ceremony and reception. Book now and receive up to $2,000 off your location fee at the acclaimed Maguire Gardens and iconic LA Public Library. The possibilities are endless at the historic Dorothy Chandler Pavilion Fifth Floor Grand Ballroom at the Los Angeles Music Center. Accentuated by subtle, warm tones, custom furnishings, and wood paneling, the iconic space features floor-to-ceiling windows revealing unparalleled views of Los Angeles and the San Gabriel Mountains painting a picture-perfect backdrop for your memorable “I do” moment. Book by March 31, 2019 and receive 30 minutes of complimentary Chef-selected tray passed hors-d'oeuvres. A wedding at Descanso Gardens is an all-encompassing package filled with natural landscape in the heart of La Canada Flintridge. We take care of every detail for your special day. Wedding locations feature a gazebo, an oak forest, a rose garden, a Japanese Teahouse, a rustic lodge and a historical mansion. Book by March 31, 2019 and receive your choice of an added service to your reception. Choices include complimentary specialty cocktail, Champagne toast, coffee service or small bite desert. A regional landmark in Orange County, Segerstrom Center for the Arts brings an elegant, artistic, and award-winning backdrop to any event. The stunning Renée and Henry Segerstrom Concert Hall offers an exceptional setting that is perfect for weddings, while the Argyos Terrace serves as an immaculate setting for receptions amidst the gorgeous architecture of the Concert Hall. Book by March 31, 2019 and receive a complimentary Late Nite Bite Station or Bar Package Upgrade for weddings booked in 2019. Nestled inside the beautiful Segerstrom Center for the Arts in Costa Mesa, California, Leatherby’s Café Rouge is a picture-perfect destination for your wedding. The ceremony is held on the fourth floor balcony that overlooks the beautiful Julianne and George Argyros Plaza and our restaurant serves as a flawless reception area. Both areas add a pristine touch to an already momentous occasion. Book by March 31, 2019 and receive 15% off your food and beverage wedding package for a weekday event before December 30, 2019. Bowers Museum in Santa Ana provides the most quintessential Southern California location for your special day. A wedding held with us excites with wonderful amenities, award-winning and innovative cuisine; your guests are served artfully curated dishes on a day you’ll never forget. Stun your guests with the Margaret and Cleo Key Courtyard or Huang Sculpture Garden as your backdrop. Book by March 31, 2019 and receive 5% off food and beverage for weddings hosted on Friday or Sunday in 2019. Cannot be redeemed for events already under contract. Not to be combined with any other offer or promotion. Must book by March 31, 2019 for events through December 30, 2019. For full terms and conditions click here.